There couldn't be a better time to innovate in the blogging space than now. The blogosphere is saturated with chatter, and some have complained that the once celebrated "A-listers" have moved on to better things like writing books and speaking leaving their blogs malnourished. 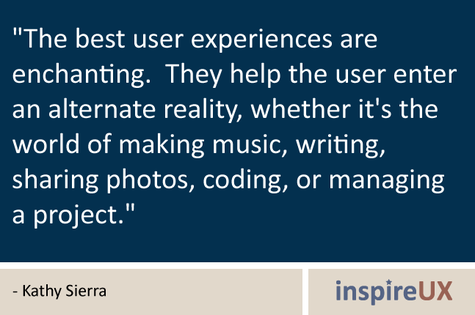 Then along comes a blog like Inspire UX by Catriona Cornett. Inspire UX is a collection of nicely designed quotes such as the image you are seeing above. I think it's a strong and simple idea. We all need some inspiration and the blog not only serves it up, but you can discuss the content of the quotes in the comments area. Catriona also goes to great lengths to provide instructions on how you can download and print the inspiration cards. And she'll even convert to vector and go "poster size" for you upon request. Not a bad business model if you ask me. And one of the coolese (and smartest) features is that you can submit your own quote for consideration. Who doesn't want to have their name in lights? Inspire UX is a simple, smart idea and I think a promising blog. Inspiraiton = value, and we all know that blogs which offer value tend to stick around, If you need a little experience design inspiration, this might be a good place to start.